1.4 Pentalock AKA "Gear Puzzle"
After going down doorway 1A from Facility 1, you should reach a room with a vehicle, dubbed "GyroCraft" by IRCplayers. Click the vehicle and select "Facility 2" on the screen that pops up. Get off the vehicle and go down the hallway in front of you. You should very quickly find log files 21 and 32, if you did not already receive them when opening day was announced. When you reach the first turn on your left and continue down the hallway you will find a room to your right, and one set of stairs going up and another going down on your left. The doorway on your right will lead you to the "Gear Puzzle". The down staircase will lead you to the constellation room, for which you will need your "Solstice" constellation. The up staircase will lead you to a room with 2 doors. The door on the left is the "Safe" room. The door on your right will be the "Dot Puzzle". If you continue down this hallway to the end you will find another split. To the left is the "Experiment Observation Room". You should find log files 25 and 26 on the floor. (After you reach 100% completion of the facility a short video of the mountain exploding will play and if you revisit the room the screen is blank and there is a red light coming from under the floor.) On your right from the split you will find the "Chain Reaction AKA lava Puzzle". 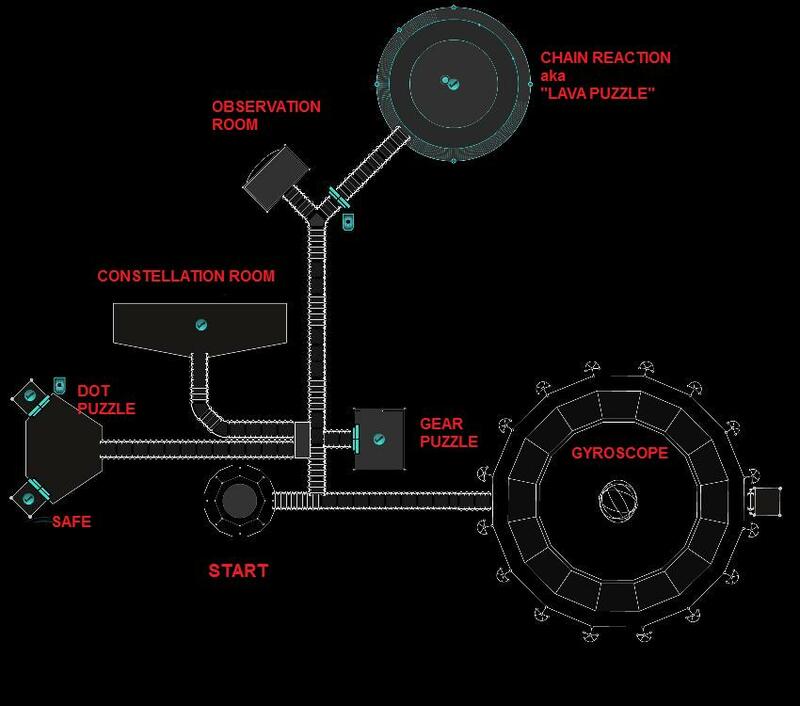 Continuing from back in the "main" hallway, at the very end you will find another gyroscope, like in facility one. Once you get all of the rings spinning, by completing all the puzzles and fully powering the facility, a bridge should form and you can walk across the platform to the other side. Where there is a filing cabinet with log files 28, 29 and 30 in it. You will need a Facility key to access this puzzle. Many of the puzzles have more than one solution. Similar to the "Music Bounce" puzzle of Facility 1, you will get more achievements and files the more levels you complete. For up to level 15 you should receive the "Fiery Furnisher" achievement along with log file 31 (if you did not already receive it before the facility opened). Upon completing level 30 you will receive the "Kineticist" achievement and unlock log file 34. After you complete level 40 you should receive the "Combustable" achievement. Connect the dots by color order listed on the right. (red 1, 2, 3, 4, etc). Each color/set should resemble a letter. Write down that letter, hit "erase" and continue onto the next color. After the first set is complete, hit the "dec" button and repeat the process. All of the letters should spell out the words: "Twelve", "hundred", "forty" and "nine". Enter these numbers into the boxes below. When you finish this puzzle you should receive the "Wordsmith" achievement along with logs 23 and 24. By using Log #31 that you either received when the opening date was announced or through the completion of level 15 of the Lava/chain reaction game. Look at the last panel of this log file, there is a drawing of an icefly and 5 pentagons with lines through them on a screen. Turn your stone pentagons, by clicking on them, in the same pattern. Upon completion of this puzzle you will receive log 22 and the "Sense of Direction" achievement. You should log files 33 and 27 laying on the floor. The basic idea is to get all of the "lights" on. Once one gear is completed, the next gear will open. Every 5 moves the gears will rotate; when working on the 2nd, 3rd and 4th gears keep this in mind because if a blank spot from another gear is touching a "lit" spot of another, changing either will have a chain reaction onto the other gears. Upon completion of this game you should receive the "Gears of Light" achievement and log files 19 and 20.